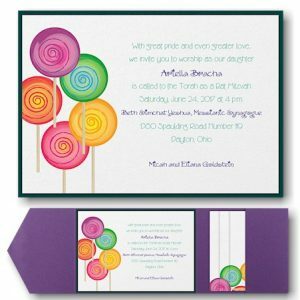 This trendy Bat Mitzvah invitation begins with a layer of Bright White Linen card stock layered over Purple Suede stock which is placed in the center of a Lavender Frost Pocket Folder. When closed, a Purple Suede rectangular label features the Bat Mitzvah’s name foil stamped in Silver and layered against Silver Mira Card stock. 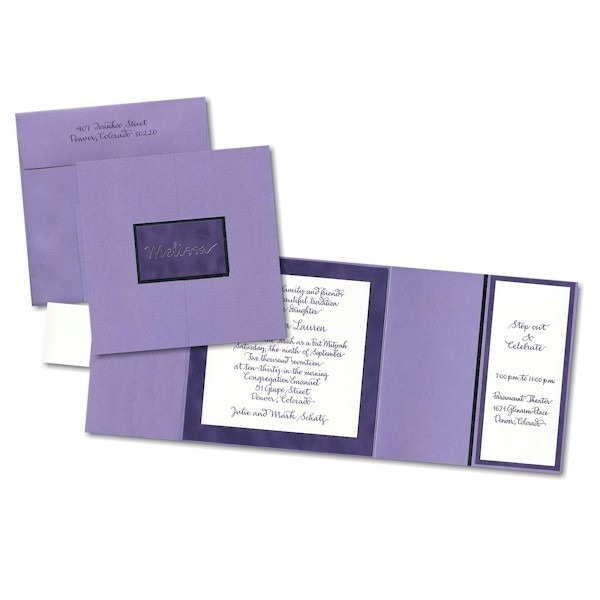 This trendy Bat Mitzvah invitation begins with a layer of Bright White Linen card stock layered over Purple Suede stock which is placed in the center of a Lavender Frost Pocket Folder. 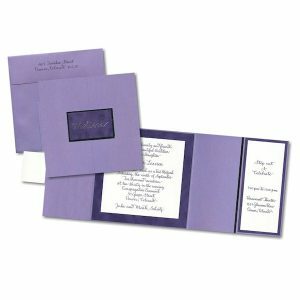 When closed, a Purple Suede rectangular label features the Bat Mitzvah’s name foil stamped in Silver and layered against Silver Mira Card stock. Measures 7-1/4″ square. Shown with Purple ink and Silver Foil stamping for the label on the front. The wording on this invitation was created by completely using hand calligraphy (add $400 if you wish to print this invitation with the typestyle “as shown”. The Response cards will print on standard Bright White Linen card stock. The Reception cards will print on Bright White Linen card stock layered over Purple Suede stock and mounted to the pocket on the inside left with a thin band of Mira Silver showing through. The Informal notes will print on Bright White folder stock. This Bat Mitzvah invitation comes with Single Bright White envelopes. Please note: Due to the impressive presentation of this invitation, additional postage is required. Consult your local Post Office for details. Please allow additional processing time of approximately 3 weeks for this high-quality invitation.